President Park Geun-hye’s confident use of English points to changing attitudes and ability for Koreans. In the 1950s South Korea was a country devastated by war. Per capita GDP was a meager $300 a year and fewer than 50 companies had more than 200 employees. Those who spoke English had an incredibly lucrative skill. They could work for the U.S. military, for embassies, for foreign companies, or as middlemen and get paid in foreign currency, making enough money to help their extended families survive. From this came the idea that you could be rich by speaking English in Korea. Sixty years later and South Korea is now a wealthy nation. Still, sixty years is not that long ago, and many Koreans have held onto the idea that the ability to speak English is worth its weight in gold. That was until President Park Geun-hye came to power in 2013. Previous presidents Lee Myung-bak, Roh Moo-hyun, Kim Dae-jung and Kim Young-sam grew up in a Korea where you could become rich if you spoke English. Park saw Korea rise out of poverty as she grew up, and English is not what did it. In The Local Constructions of a Global Language, Joseph Park wrote about how Koreans thought of the English language, which is through the concepts of necessitation, self-deprecation and externalization. It is viewed as a necessary language, you have to be humble when speaking it and keep in mind that it is the language of the out-group. That was until Park came to power. 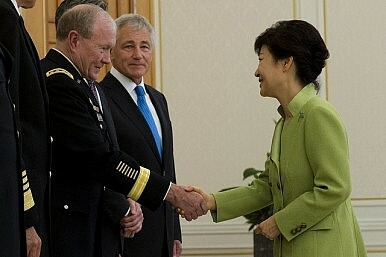 Park broke a long-held taboo by delivering public speeches in English at international events, when the previous presidents had always spoken Korean. Unlike Ban Ki Moon’s English, Park’s English is fluent and easy to understand. I remember being at Seoul Station, the capital’s main railway station, as Koreans looked in awe at Park delivering a speech in confident English at the World Economic Forum. By doing so, she broke the myth that English was the language of the out-group, or that you had to be humble when using the global language. Park has also been busy on policies surrounding English instruction. Koreans have been spending on average $15 billion on private English education, with 17,000 English cram schools (known as hagwons) scattered across the nation and an army of 30,000 native English teachers, along with thousands more who teach English illegally. Park has been taking numerous measures to curb the national passion for English, dubbed “English fever” by some. When Kim Young Sam started the Segyehwa (globalization) policy in 1993, he sought to create a bilingual workforce who could serve the needs of an increasingly global market. Back then, even embassies had trouble finding staff who could communicate in English, and foreign businessmen often complained that no one could help them communicate. Twenty-one years later, 50 percent of Koreans under the age of forty said they could understand basic English according to a poll, and 10 percent said they were fluent. Since 2008, with the global recession hitting North America, thousands of bilingual Korean-Canadians and Korean-Americans have flocked to South Korea, where the job market was more favorable. That helped solve South Korea’s shortage of skilled bilingual labor. Noticing this, Park has taken stringent measures affecting the English education sector. The number of native English speakers at the public school level, teaching the EPIK (English Program in Korea) dropped by 10 percent in 2014. The number of native speakers teaching at universities has dropped considerably since a presidential decree stating that university English instructors should have at least four years research experience after their Bachelor’s degree, meaning they need to have either a Ph.D. or a master’s degree and two years’ experience as instructors at a university. Hagwons were also affected by Park’s policy: they can no longer teach material higher than the students’ current level. Before Park, several hagwons taught high school materials to elementary school students. Because of the College Scholastic Ability Test (CSAT), the highly competitive university entrance examination, South Korean parents would put their children into hagwons, which prepare them for the test, from Grade 1. Since February 2014, that is no longer possible. The native English teacher subculture in Korea has also changed dramatically. Job hopping used to be common among native teachers, but that has stopped. In the past, native teachers would move from school to school as they gained experience, starting off at a school with long hours and low pay, and ending up at universities where they taught as few as nine hours a week, had no research requirements, and got paid as much as $3,000 dollars a month or more, although most taught more and made less. While teachers are renewing their contracts with their schools, teaching hours have gone up and salaries have stagnated, or in some cases deteriorated. Most schools now expect teachers to be present from 9 am sometimes until 10 pm, salaries have not risen since the mid-2000s, and have remained at around $2,000 a month. Bringing in 30,000 native teachers, many of whom did not have teaching-related degrees, was done with the underlying assumption that with more native speakers, South Koreans would better learn English. That has paid off to a certain extent. During the last decade Korea had an average TOEFL score in the 70s; it was 85 this year. Test scores are going up, and with the president speaking fluent English in public with no sign of ill ease, many Koreans have followed suit. In the past, Koreans were expected to apologize before speaking English, and to do so with humility. That is no longer the case. Increasingly now I find Koreans unafraid to approach me, speaking in English. As for the future of English in Korea, it seems as though Park has demystified the English language and shown Koreans that they can speak it with confidence. But some of the problems still exist: an over-reliance on test scores, poor writing skills and the stigma of speaking English in public. Maybe that too could change. Asia is seeing a new wave of successful female politicians, but getting to the top requires hard choices.